Eodem die, 3a vice lecta est Billa, touching Farmers that make Leases over to others at a greater Rent, et commissa Domino Mountague, Justitiario Portman, Justitiario Hales, et Solicitatori Regis. 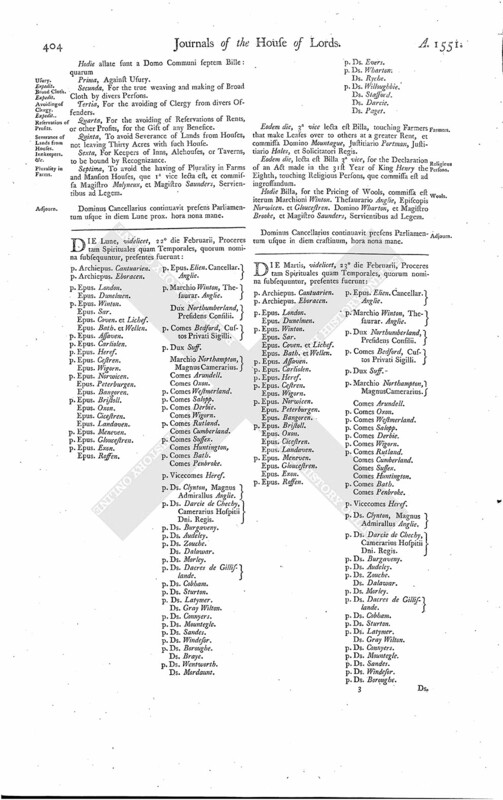 Eodem die, lecta est Billa 3a vice, for the Declaration of an Act made in the 31st Year of King Henry the Eighth, touching Religious Persons, que commissa est ad ingrossandum. Hodie Billa, for the Pricing of Wools, commissa est iterum Marchioni Winton. Thesaurario Anglie, Episcopis Norwicen. et Gloucestren. Domino Wharton, et Magistro Brooke, et Magistro Saunders, Servientibus ad Legem.